If you want to optimize and compress the images for your website or any other purpose without losing its quality, the best available option in your ubuntu is Trimage. 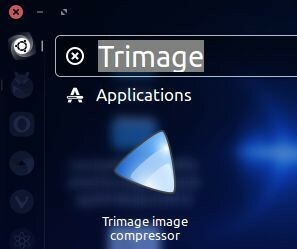 Trimage is a cross-platform tool with GUI and command-line interface to compress and optimize JPG and PNG image files. It uses optipng, pngcrush, advpng and jpegoptim libs for compression. The supported file formats are PNG and JPG. The compression is losslessy compression and it removes all EXIF and other metadatas. To install Trimage on ubuntu, Open your ubuntu terminal. To open terminal in ubuntu click the Dash home from unity launcher.And type terminal in the search field. And click Terminal. After that install Trimage by typing this command in terminal. You can also install it via ubuntu software. After the successful installation of Trimage restart your ubuntu. To open Trimage, click the Dash home from unity launcher. And type Trimage in the search field. Then click Trimage. The user interface is simple. Just drag and drop images on the window or click the Add and compress button to add images and compress. After the compress it will show the results.